Germany's abrupt change in nuclear policy has put a dent of €1.3 billion ($1.7 billion) in RWE's results for FY2011. It also boosted power prices and raised carbon dioxide emissions, the company said in its annual report to shareholders. The company described Germany's unique reaction to the Fukushima accident as the major factor in a year "marked by difficult economic and political framework conditions" that saw declines in all its operating areas. Overall, electricity generation was 9% lower than FY2010, due in part to the overnight loss of freedom to operate its Biblis A and B nuclear power reactors. The pressurized water reactors with capacities of 1167 MWe and 1240 MWe respectively were ordered by the German government to be shut down for a three-month 'moratorium' on nuclear energy in the immediate wake of the Fukushima accident. A legal change subsequently prohibited the untis from ever restarting and this imposed a "heavy burden on earnings," said RWE. 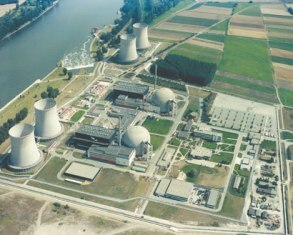 Similar burdens fell on Germany's other three nuclear operators, EON, EnBW and Vattenfall, which were all hit to a greater or lesser degree by the shutdowns of six reactors across their fleets. Compared to FY2010 figures, RWE reported electricity sales down 5.3% from its entire operation, gas sales down 18.5% due to warmer conditions, and an operating result down 24.3%. Pre-tax income was some 39.3% lower than last year and net income was down 45.4%. Among the figures moving upwards was the amount of carbon dioxide produced by RWE for each unit of electricity. This went up 8.2% from 0.732 to 0.787 tonnes per MWh "mainly because our Biblis nuclear power station stopped operating," it said. Nuclear power contributed 8% to the company's power mix instead of 12% as it did in FY2010. Meanwhile, the price of carbon dioxide emission allowances collapsed through 2011 and reduced the financial impact of this setback. Also up, by €474 million ($622 million), was RWE's provision for the dismantling of its nuclear plants as a result of this being planned earlier than before. On the other hand, the power plants will have less used fuel for for disposal, and the predicted bill for this dropped by €173 million ($227 million). Operational waste allowances increased by €55 million ($72 million) during the year and the company recorded an overall provision for these activities up by €356 million to €10,366 million (by $467 million to $13,606 million). RWE linked the nuclear shutdown and a general rise in the cost of fuel to a hike in wholesale power prices. It said that the price of base-load power on the EEX Energy Exchange in 2011 had averaged €51 ($66) per MWh and peaked at around €61 ($80) per MWh. These figures represent increases of 16% and 10% on 2010 figures of €44 and €55 ($57 and $72) per MWh. Furthermore, it noted that it's Gundremmingen B reactor will be taken offline at the end of 2017 and "This affects our carbon dioxide reduction path through to 2020 significantly." Shortly after that, RWE will also lose nuclear generation from Gundremmingen C (in 2021) and Emsland (in 2022). Overseas, RWE continues to invest in nuclear energy. Last year it bought a 30% stake in EPZ of the Netherlands and the Borssele nuclear power plant it operates, enabling RWE to market 30% of power produced by the 406 MWe unit. RWE also maintains a 50% stake in the Horizon Nuclear Power joint venture with EOn that is seeking to build new nuclear power plants at Wylfa and Oldbury in the UK for a total of 6000 MWe by 2025.